......................... transformation, which is then displayed automatically. PURPOSE: To generate a piece-wise linear mapping grayscale look up table and applies it to an image (infile) to generate a new image (outfile). DESCRIPTION: PLM takes the supplied break point pairs and generates a one dimensional piece-wise linear grayscale look up table image that is used to change grayscale values in the channels of the input image. From 1 to 40 point pairs can be supplied either as arguments or in a text file with one pair per line supplied. 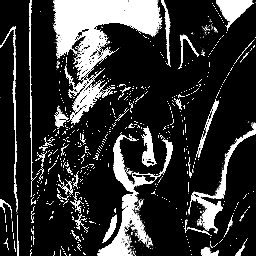 The x value is the position in the look up table which is associated with the grayscale value of the desired channels of the input image and the y value is the associated grayscale value for the corresponding channels in the resulting output image. "x1,y1 x2,y2" ... List of x,y break-points for the piece-wise linear transformation. The x,y values are non-negative break-point pairs for the piece-wise linear transformation. There is a minimum one point pair that must be supplied. The x and y values are associated with the input and output grayscale values of the look up table, where x,y values can range from 0 to xscale,yscale. xscale determines the length of the 1D lookup table (length=xscale + 1); that is, the range of x (input) values and yscale determines the range of y (output) values. Both xscale and yscale must be positive integers and their defaults are 100. If the first pair is not 0,0 or the last pair is not xscale,yscale then those points will be added automatically to the list of point pairs. IMPORTANT: the list of break-point pairs must be specified just prior to infile outfile. -c channel ... CHANNEL to process. Options are: red, green, blue, lightness (L from HSL), brightness (B from HSB), luma (Y from YCbCr) and luminosity (L from Lab). The default=all rgb channels. -g ... enables the creation of a graph of the piece-wise linear transformation, which is then displayed automatically. There is a default setting below that can be changed to enable this to be save to a file named outfile_graph.gif. The graph will be scaled to size 100x100. IMPORTANT: To end the script, close/quit the graph image. "0,0 40,0 40,100 60,100 60,0 100,0"
"0,0 25,100 25,0 50,100 50,0 75,100 75,0 100,100"